This unique home is nestled in quiet one block neighborhood with an ocean view from the back lanai (porch). Being just eight short miles north from Historic Hilo you get the convenience of being close to town and still having your privacy. Also not far away is Akaka Falls and Hawaii Tropical Botanical Garden. Shop in historic Hilo Town and get fresh produce at the Farmers Market. Rainbow Falls and Boiling Pots are just a heartbeat away. Coconut Island is awesome for dipping in the ocean and maybe catching a glimpse of sea turtles. This fully furnished home has one bedroom and two full baths. 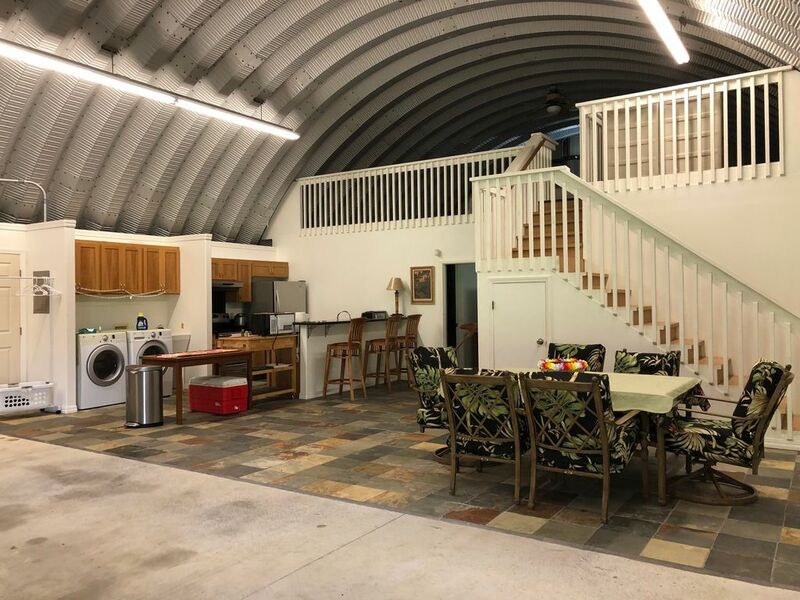 This retreat comes with a lanai, big screen TV, DVD player, fully equipped kitchen, blender, microwave, coffee maker, dishwasher, washer, dryer, and a gated entrance. This property is listed as a vacation home. Monthly rates are not available. I was born and raised on the Big Island and met my husband while he was building the Mauna Kea Cal Tech Observatory. When his job came to an end we went to the Mainland but this home will always have a special place in our hearts. We love this property because it feels private and yet it is still close to Hilo Town. It's just a short ride away to the farmers market, shopping, golfing, and beaches. We love to sit out on the lanai and look out over Hilo Bay and watch the cruise ships come and go. It truly is our little peace of paradise. Just one look and you can tell that the house itself is a unique benefit. It is so peaceful to sit on the lanai and listen to the wind blow through the palm trees while looking out over the ocean. You can also see Onamea Bay off to the right. You can even hear the whales thumping their tails when they come in the winter and early spring. The driveway is on a slope and we ask that the parking brake please remain engaged while in the driveway. Please do not park in the street. Will give wifi code when due to arrive. The kitchen is fully stocked with dishes and utensils. There is a flat top stove/oven, refrigerator, microwave, toaster oven, coffee maker, dishwasher, and rice cooker. The table seats 6 and there are three chairs at the bar as well. Your own device can be hooked into the stereo so can listen to your own play list if desired. This is a truly unique house with a stunning location and view. The house is tucked away on a small street just north of Hilo. Homeowners provided excellent directions to get there. We appreciated the thoughtful welcome basket. The house was clean and had all the necessary amenities. Sitting outside we had a great view of the ocean and saw whales breaching and playing in the water! The house is close to all the area attractions. It was a quiet place to stay after the day's sightseeing and it was lovely to wake up to a beautiful sunrise and the bird songs. Homeowners are very responsive. When the power on the street went out, Joel contacted us to let us know the utility company was working on the issue and in fact power came back on shortly after. The front area can feel dark and cold but the back area is warm and cozy and this is where you will spend more time anyway. The door to the lanai needed to be lifted to open and the sliding screen door had to be finessed for the magnets to stay in place, but these were minor issues. We would definitely stay at this property again. It definitely is unorthodox, however the scenery is spectacular, and the unit is nice. Overall we had a great stay. Beautiful location with views of the ocean. The only thing missing was a corkscrew so we bought one and left it behind for the next guest. Bit of funky place but really relaxing and comfortable. Great furnishings and the view off the lanai is priceless. In a great location, and the place has beautiful view from the background. Thank you so much for your review. We are so glad you enjoyed your stay. Merry Christmas! It looked unique but I wasn’t prepared for the lizards and birds inside the area. The screens were falling off which let in birds and lizards. We closed off the kitchen and lived in the bedroom area. The bathroom shower was awesome. The deck and view were fabulous. A little maintenance would help this place. Thank you for giving us a review of the property. We do read them all and respond to anything we feel we need to address. The home was inspected and all screens are secure. With the roof being metal there could have been birds on top of the roof that may have sounded like they were in the house. which is the gecko. Geckos are a part of life here in Hawaii that everyone lives with. They help keep insects away and some even believe the brown ones are good luck. We are glad you enjoyed your stay and hope you had a wonderful vacation. Check-in is at 3:00pm and Check-out is at 10:00am. Directions to the home will be provided 5-10 prior to due date.